➝ Via Clare, Genevieve Valentine shares what she wrote in 2014. Out of fiction, I can highly recommend The Girls at the Kingfisher Club (which I reviewed here and loved) and Dream Houses, which I think I liked a lot — I'm still processing it. ➝ Recently I became a Goodreads author, after claiming a piece of fanfic I wrote that someone else added to the site. This is sort of a downside because they give you stats, and it's not like I need any more ratings in order to judge my self-worth by. Also, having an author profile downplays the books you're reading (dear Goodreads, can't you have an option to toggle the order??) and you don't get to have a favorite book shelf that appears on your profile anymore. :( Anyway, I was talking about this with a friend and they shared Why It’s Bad Fandom Etiquette To Put Other People's Fics On Goodreads. I'm not as hard line, but I understand why other people are. Although this isn't the same as the past debates fandom has had about transforming fan work (via remix, or podfic, etc. ), I thought that how fandom handled it — providing blanket person or including restrictions/guidelines on profile pages — was an uneven, but potentially viable, solution (at least it worked well for me). But this is a little more complicated, because nothing's been changed in this case. As the essay above says, what's happening is that fanfic is being placed into a new context alongside professionally published books that have undergone different types of editing and gone through very different processes to exist, and it can be stressful. For myself, I'm fine with it, but it makes a lot of sense why others are dubious about this becoming normalized as culture shifts to view fanfic as just another thing to read. ➝ Did Kevin From ‘Home Alone’ Grow Up to Be Jigsaw? A Deadly Serious Investigation — this is the greatest piece of fictional source investigation/deconstruction I have read all year. Five stars. ➝ The other week I finally sat down and caught up on the archives of Chaos Horizon, a blog that's attempting to predict the Hugo and Nebula votes based on ~data~. I love this idea, although I've found it's better to consume the blog in chunks because otherwise you get to the end of an entry and find a "to be continued" and you want to claw your eyes out. Or maybe I'm just bad at cliffhangers. Anyway, one of things this blog wasn't mentioning was YA. I found this to be a huge oversight, because it's super relevant in a data project to look at those numbers because there's tons of them. The Hugos aren't friendly to some adult subgenres and those were still covered in a "these are popular but have no chance because of X, Y, Z", so the lack of contextualizing popular YA in this conversation seemed super weird. But finally they did it! I just wanted one post talking about the bias against YA SF among the Hugo voting majority, and I got five posts. Happy early birthday to me! Thanks, Chaos Horizon! ➝ Taylor Swift's 'Time' & 'Businessweek' Cover Photos Are Powerful, Assertive, & Different From The Rest was a really eye-opening piece for me. ➝ I'm afraid Professor McJerkface has some bad news, everyone. 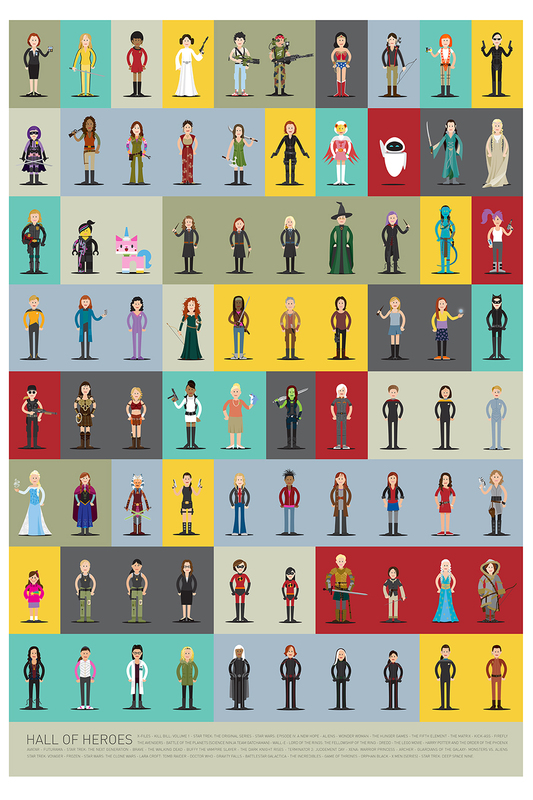 ➝ I love this female character Wall of Heroes so much :D (via Bookshelves of Doom). ➝ Jenny completely sold me on Texts from Jane Eyre when she shared this excellent review by Sarah Mesle. ➝ Meritocracy indeed: Poor kids who do everything right don’t do better than rich kids who do everything wrong. ➝ Hooray — Stefanie read Unspeakable Things and loved it. She says: "Unspeakable Things is a potentially incendiary book. It is dangerous. I highly recommend it." So the first thing that princess culture does is it gives a girl a world where she, as a female, takes center stage. She is the main character, the lead, with the men providing supporting roles. There is no need for the child playing princess to imagine herself as Henry Potter's secret twin sister Henrietta to make herself the hero: the princess is already the hero. In those days, making mixtapes was my way of saying that I love you. You didn’t have to be my boyfriend, or someone who I wanted to be my boyfriend. It didn’t have to be that sort of love. But when I saw someone’s soul and I thought it might look a bit like my soul, I would make them a mixtape. Here are the songs that express a piece of me that I don’t know how else to express, but I think you might understand. Play it loud. ➝ The Sunday Times & Sky Sports Sportswomen of the Year Awards have been announced. Dressage queen Charlotte Dujardin, who I had the privilege of seeing at the 2012 Olympics, took the main award. And my pet fav British gymnast (now that Tweddle has retired) Claudia Frangipane got the Young Sportswoman Award — eeeee, she's so great. ➝ Lauren Faust to direct a cartoon feature about a modern age Medusa!! Medusa is such a boss mythological character (snake hair is 100% rock and roll) but I haven't seen that many great stories about her, so I'm psyched that we could be getting an animated film from one of the coolest women in cartoons. ➝ Women can now be Church of England bishops. ➝ Elbow filmed their video for Charge at Belle Vue speedway! If you want to get a flavour for one of the lesser known sports that I follow take a look at this vid. ➝ I think this art piece, The knight and her queen, is relevant to a lot of my friend's interests. ➝ Speaking of art, I love these Witch Weekly covers showing female characters from the Harry Potter films. Alberto Seveso and South African artist Chris Slabber has created a spectacular new series called Destruction/Creation, which features images of gorgeous “sculptures” formed from paint swirling in water. The variety of projects artists attempt is amazing. I had to scrunch my face very much over that whole Jacqueline Woodson watermelon joke business. I wish people wouldn't so regularly, and so predictably, put their foots in their mouths. Renay, that link about putting fanfics up on Goodreads is so important. The communal context is so important. Jodie, that mixtape link is brilliant.